Adani Shantigram The North Park: Beautiful homes in the lap of nature! Adani Group has launched ultra luxurious villas in Ahmadabad, called Adani Shantigram The North Park which is designed for connoisseurs of fine living. The homes are an ideal mix of classical and modern style architecture. They are an oasis away from the hustle and bustle of the city, with beautiful rolling green lawns and gravelled driveways meant for a select few. The North Park has luxurious 4 BHK, 5 BHK, and 6 BHK villas. The ultra-luxurious homes have a private swimming pool, pool, and Jacuzzi. There is a separate servant room, spacious decks and terraces. There are dedicated parking bays and multi-tier security. Residents get exclusive membership to the Golf and country club. Adani Shantigram bungalows are designed for modern home buyers, looking for an exclusive community filled with luxury. The premium community has a verdant green 9 hole signature golf course. The residential complex is equipped with various facilities including gym, swimming pool, kids’ play area, state of the art club house, multipurpose hall, and much more. The eco-friendly project has rain water harvesting, beautiful landscaped gardens, and 24-hours water supply. Other amenities available to residents include aerobics / yoga area, basketball, tennis, badminton, and volleyball courts. There is a lakeside promenade which provides a calming experience as well as senior citizen sit outs. Adani the North Park has something for every member of your family. 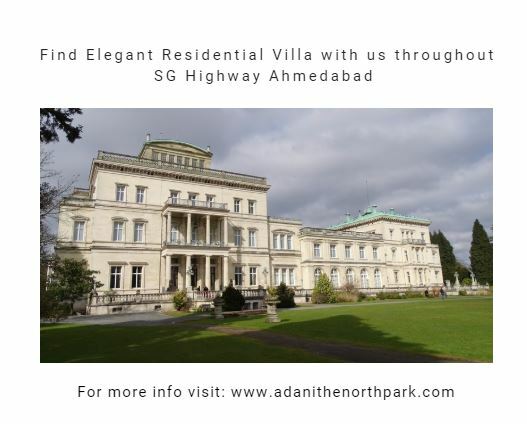 Located in Vaishno Devi Circle on SG Highway, Adani The North Park Ahmadabad is near a number of renowned educational institutes, train and bus stations, restaurants, hospitals, and petrol pumps. 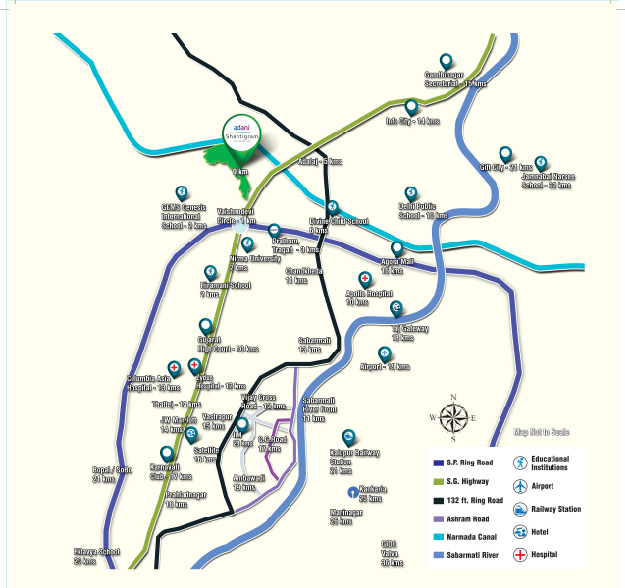 The area is one of the most sought after in Ahmadabad. There are a number of well known schools including Khodiar Primary School, GEMS, Darshanam Sanskrit MahaVidyalaya, Genesis International School, Dhaval Zalavadiya, Shree Swaminarayan Gurukul Vishwavidya Pratishthanam, SGVP Dharmajivanam, SGVP International School, Oakbrook Business School, Patel Hostel, Global Indian International School, Earth School, DPS Greenwood, and more near the complex. Key hospitals near the locality are Mediclaim Hospital, Arihant Hospital, Mahalaxmi Enterprise, Amba Health Center, Iffco Hospital, Chitra Hospital, Divya Children`s Hospital, Vakil Dispensary, Devarshi Super Speciality Hospital, and others. Apart from this, a number of leading five star hotels, restaurants, shopping malls, are located near the project. The area is well-connected to surrounding neighbourhoods via an excellent road network. Adani Shantigram The North Park is one of the most beautiful offerings by Adani Group in the heart of Ahmadabad. The developer is known for excellent and innovative residential projects filled with the latest amenities for modern home buyers. This is the most exclusive address for home buyers. This is a golden investment opportunity and is expected to give excellent returns over the next few years. So hurry and book your ultra luxurious home in Ahmadabad now! Located on a High Speed Corridor near Nirma Unversity. 15 Min away from Domestic and International Airport.